Your impressions are similar to mine, I was only on it for a demo ride to short to be sure though. The seat is nice :) I still love my S1000R more than anything else I've had a chance to ride though the Aprilia Tuono was a very close 2nd. FZ10/MT10 for US market a specific mapping in all 3 modes , paying round about 7 HP and lot of torque. I was convinced I was going to buy an MT10, in fact, last week when i bought the BMW I was out on an MT10 for the second time, just to make sure I was happy with my purchase, the BMW salesman rung me to see if I was going to buy an s1000 after test riding it a few weeks ago. I thought the BMW edged it but the MT was a better value buy ...but theres a twist to that tale ill explain below. 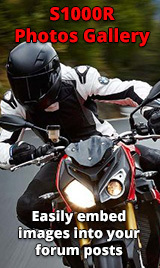 The S1000 felt lighter,(it is I believe) handled better(lighter steering and a quicker turn in, felt more a sportsbike ) and had way better initial bite and feel from the brakes. The BMW engine felt a bit buzzy and vibey at 80-90ish but super smooth elsewhere, the throttle wasnt as snatchy as the MT and it felt quite a bit faster, maybe it just has more of revvy, top end feel and doesnt really make any more HP(MT 160 claimed Vs the BMWs 165) but it seemed more vivid acceleration wise. Looks are subjective, some areas of the BMW look better than the MT and Vs versa, I particulary disliked the coolant expansion bottle sticking out and the whole area of the radiator/oil cooler frontage, BMW has done a better job of that but you couldnt call either bike "lookers"! I thought the BMW Sport was better value(£12,000) when you look at the electrical wizardry it has compared to the base MT10 and equaling ( I think?) the SP at what, £13,500-£14,000? The 2018 MT has a up only quick shifter as standard. Character is a hard thing to define and I can see why some people criticise the BMW over the MT for that as its "another IL4" but is a snatchy throttle Vs a smooth one annoying or "character"? Apart from the awesome noise and instant wheelies of the MT, it has for me a couple of other pros, it is more practical with a power socket up front as standard and a rack/top box fitment available. The MT is slighly more upright with a little more leg room but the BMW certainly wasnt uncomfortable for me. The clincher was that I did prefer the BMW but the local Yamaha dealer is a miserable so and so and the local BMW boys and girls treated me very well, when BMW offered me a deal that undercut the base MT10 on both price and a better finance rate, I couldnt say No!